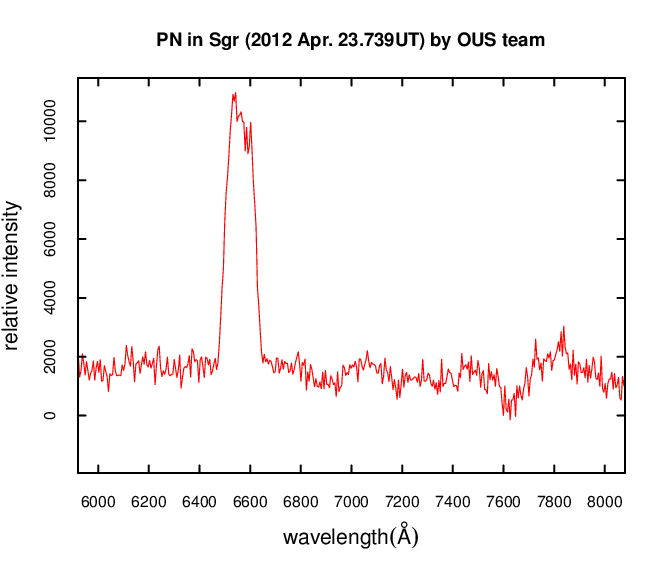 Breaking News for sky aficionados: Solar satellite "filmed" complete Nova Sgr 2012 outburst with high cadence! 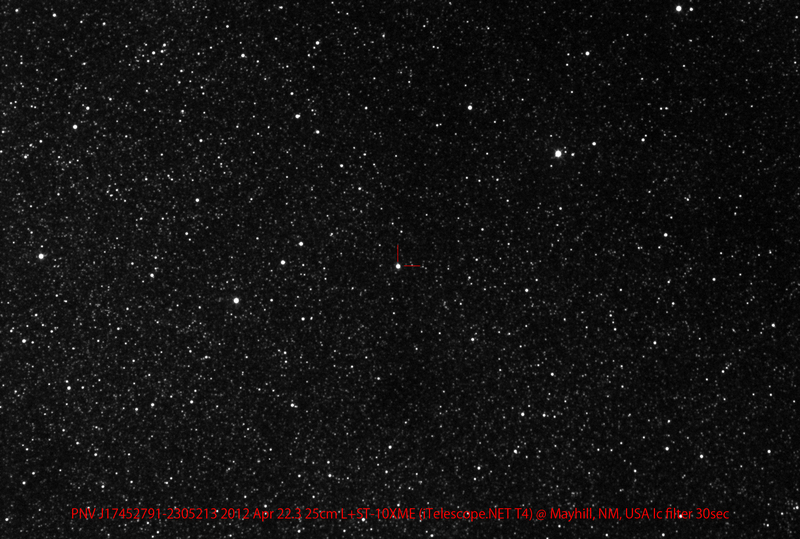 Solar satellite "filmed" complete Nova Sgr 2012 outburst with high cadence! This could be a first in nova research: When Nova Sagittarii 2012 alias PNV J17452791-2305213 erupted on April 21, the satellite STEREO B had the field firmly in its view, and from the inadventend high-cadence photometry an impressive lightcurve has been generated, showing the complete peak! Whether such a record is unprecedented isn't clear yet. The nova reached 8.8 mag. briefly; since the nova has faded a lot: discovery pictures here and here, early spectra here and here (strong H-Alpha) and reports here and here. • Also blazar OJ 287 is flaring and in a high optical state, though not brighter than 13.5 mag. On the Sun a prominence & CME on April 22, a prominence and sunspot details on April 21, a prominence on April 17 and a famous prominence (more) on April 16. • The SDO has been in orbit for 2 years, generating lots of pretty pictures. • An EGU press conference on space weather forecasting (abstracts links and COMESEP's home), ISWI and another doom story, picked up here and here. • Hinode sees a pole asymmetry. • Camilla visited the stratosphere (not 'space'), generating publicity for NASA like here, here (7:10-42), here, here and even here. Minor bodies in the news: Comet Garradd on April 18, April 17 and April 16, plus Faulkes observations of the Rosetta target. • Trans-Neptunian star occultations til 2015. • Yet more evidence against the Dryas impact and the impact history of the Earth. • The Target Asteroids! project explained here, here, here and here, plus a study on capturing a NEO. • A great bolide over the U.S., dropping meteorites in old gold rush country, a Brazilian bolide and the usual Lyrids. Planets now well placed - a long-term calculation of altitudes for Germany - are Saturn (April 21 [dito and dito], April 12 [dito] and near opposition pictures), Mars (on April 19, April 16, April 7 and March 29/30) and Venus: a deeep picture in the Pleiades and with the Moon - and Obama. • Being so bright and well-placed - and thus also the sky highlight of early May - Venus also caused various UFO alerts, notably on German TV (covered also here, here, here and here) or here. While Venus looks like this right now (or like this in the near IR), it's prone to video artefacts. • And talking about a misunderstood Venus, its role in a famous aircraft incident in Jan. 2011 is less clear than in all the news coverage e.g. here, here, here, here, here or here as reading the actual investigation report shows. • Finally Mercury & the Moon on April 19 from Oz.